Jeane: My dream last night started out with me wandering through the desert with a group. There are people that are guiding us through – they’re like Bedouins, except that they’re wearing indigo colored robes. Initially, we just follow them. As we get deeper into the desert, there are areas with rising rock walls that we go between. I move closer to our guides, getting right in behind them. When I do, it suddenly feels like I’m under their protection, or it feels like I’m one of them. I don’t have the sense of being separate. I can feel that I have a certain protection from them that allows me to stay out where they are, even though I’m not a Bedouin (or whichever tribe this group is from). As the dream goes on, we come to an area where there are caves, and I think people are flying overhead in helicopters and hunting. It’s almost like there are military exercises going on or something, so it’s important that people know who’s on their side and who’s not. At this point I realize I can make certain sounds, and even run through the caves, and be recognized by the Bedouins and even by some of the people in the helicopters. I can also find my way back to the group or be separated out if that’s what’s needed. I have to remember the songs, and also remember the way back and forth. It seems like there has to be this form of signaling because otherwise the people flying above, and just seeing everyone in the desert, wouldn’t really be able to tell who was on their side or not. John: The Bedouins, a nomadic desert tribe, represent, in this image, something that sits in this huge overall spaciousness – the open desert – and opens up perception and awareness. The Bedouins, as a tribe, also represent something connected into a period of time that stretches back thousands of years, flowing in an overallness in which very little has changed. In coming to recognize this overallness, through this vibration inside you, you are also becoming aware of things that can cause you to get a little disoriented (feel hunted), in relationship to this greater overallness that has opened up. But you have your guides, and you’ve found, because you have a comfortability in Creation, that you can use songs to move about in order to make yourself known. In other words, these songs or sounds create a connection, or a linkage, through which you can be just fine in this overall greater spaciousness, i.e., you can be just as at home in the desert as a Bedouin, knowing how to safely come and go. In other words, you have found the means by which you can better appreciate this expanded space that you have opened up, which has an orientation to the past, and a sense of freedom. You have gained an understanding of your whereabouts within this space and, if in doubt, you have learned to use sound to orient yourself. In a sense, you have proven that you are not an outsider in this greater space, but an accepted participant who belongs there. That’s an important idea in a spiritual journey: a human being who lets go of personal ego and cultural, planetary attachments, does so in an effort to join with something else, something much greater, which is already in progress. The idea of joining an already ancient process, which is playing out at a universal level, requires that we humans get to know Its ways – that we learn to fit into It, and to be like It. It is a truth of the human journey that Creation will never exclude us from participating, but we can (and do) exclude ourselves by being out of alignment with its ways and purposes. John: I keep dreaming that there is a dominant, inner expression that dictates the outer life. This is an influence that is familiar, deep within my natural frame of reference. However, the loudness of everything else – the superficial – drowns out this effect over the short run. So this influence silently dictates the overall way things unfold, even though it’s not readily apparent in the outer. In one image, I see this inner expression represented as a skeletal frame that holds things together. The outer features are what I notice at first, and am apt to be swayed by – like the skin and the flesh on this frame – on a moment-by-moment basis. As a result, the controlling feature in life (the inner expression) takes a backseat to everything else in the outer environment. Or so it seems, even though in the long run the skeletal backbone to life is what ultimately wins out. In other words, what I saw is this skeletal structure, and it comes all the way down to the ground. So there’s something about the structure that makes an energetic connection to everything that’s rooted in creation. Then the shell, the body, the flesh, and the skin on it is what people pay attention to, it’s what they see, so they’re not aware that there is an aliveness to the structure that actually dictates what is meant to be and how things are to unfold. Everyone is paying attention to what is more apparent or obvious, i.e., the denser, outer layer, which is just the wrapper, or the exterior of the skeletal structure. So people base their choices and actions according to appearances, because that’s the easiest to sense and to see. In other words, the invisible skeletal structure carries the energetic or vibration of what’s meant to be, not the skin and the flesh and everything else that’s visible. But it’s the outer, visible layer that has a loudness that captures the senses, and draws everyone’s attention. 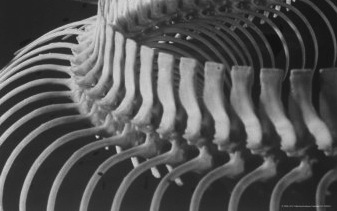 Of course, in the long run, what wins out, in terms of what is meant to be, is determined by the skeletal structure. Isn’t that a strange image? So in this dream I feel fortunate in knowing what is actually affecting what manifests in the outer. It’s a wonderful feeling of relief to know that there is inner guidance, determined or destined to come to the forefront of my being. First of all, I sense this in a fairly general way, but then I realize that my attention is drawn more to the skeletal structure than it is to the outer layers. I do not readily grasp this. I can feel it and I can know it, but I lose sight of this knowing when I’m caught up in some situation that requires my immediate attention. Even then, when I’m unable to hold onto an inner balance, I’m comforted in a subconscious way with knowing that there is the essence of what is meant to be, like it’s waiting for me to go there, to look there. In the dream, because I’ve made the choice to have the inner framework to life dictate how I’m meant to live, even my mistakes and detours are simply guided and shaped into what is intended. I find that amazing. In other words, as I fumble about it’s almost like something else is directing me because whatever I’m doing is being transformed somehow. It’s affected. Sometimes I suffer when this happens, but at other times my input is redirected and guided to bring out the intended inner effect. I come to know and trust this inner expression, even though it’s not visible; for me it is just as real as what is visible. What is visible in the outer is there for appearances only. I’ve become able to see the deeper thread of things, beyond the noisy surface. This cannot be said, however, for my coarser nature that is still dominated by the appearances of the outer world, fed only by the physical senses. What I’m describing is a subtle awakening, of my consciousness, to that which lies deep within my nature. It gives me joy each time I’m able to break through the outer barriers and be touched by this inner essence, which waits patiently for me to attune myself to its existence at the core of my being. John: In yesterday’s dreams (see Structural Integrity), I was shown that the old way of doing things – human history and culture – pushes a certain raw energy over everything in its path, seen in the image of the cattle herd. So when I’m going against the grain, against the herd by choosing a spiritual view of life, in order for it to be effective I have to have an inflection from within – a radiation – of my intentions. Only such a radiation, or intention, originating in my inner self and connected to the whole of the universe, can cause an epiphany, or realization, that can allow the flow of raw energy to shift. The cattle drive cannot be stopped just by wishing or hoping, only an energetic signal, which directs the cattle to behave in a different way, can effect a real change. That’s why it is said in spiritual pursuits that one must hold within them the energy of the change they want to see. Then the sensitivities of others can pick up that signal, whether consciously or unconsciously, and be changed by it. That’s what it means to be in service to god and creation – to radiate what they are, and what we are within them, to the things around us. The movement of a herd mentality, again representing human culture, has lost its inner connection and moves only by the signals and energy of the surface aspects – TV, Internet, news, advertising, etc. But no one of us can run headlong into it on our own, unless we have the potent energy of our own inner connections to creation. So, those dreams were something of an introduction. Everything doesn’t get sorted out in a few short dreams or in one night of dreaming. Since coming to Las Vegas, I’ve started to realize that I’m experiencing myself completely in an awkward state and condition, both in dealing with the crazy energy of this city externally, as well as the effect that energy is having on my inner life and balance. I find myself feeling irritated and upset during the day, and in my dream images I have the same sense of disorientation, which my dreams are trying to help give me insight into and show me the way to rebalance myself in this new environment. A person could easily be swept away by what goes on in Las Vegas, or anywhere in the culture, so it must be an inner choice to maintain the connections that have already been established through spiritual work. I have to admit that the whole scenario of what I went through in my dreams felt pretty dramatic, but I know there was a lot going on in terms of an attempt to align, and to adjust, and to reach to something inside that could handle all of this. At first blush the external world of Las Vegas seems overwhelming. Even in my sleep I was pondering, as I would drift closer to waking or fade back into sleep, if this was a type of raw energy, or a dark energy behind which could be an amazing thing. To find out, one has to, at some point, face all of this in order to get through and see what might be possible. This caused me to ponder the idea, considering that Las Vegas is the brightest place on earth when viewed from space, “Am I trying to hold together something that is completely dispersed?” Because what I notice is that people seem to have no sensation as they walk around. They don’t know how to flow. I have to get out of their way because they fumble about as if they’re in a trance. They’ll bump into you! It’s not just that everything is bizarre and over the top, there’s also a tremendous sense of disorientation in terms of how people seem to be. For us to be able to maintain our inner lives in this environment requires us to stay conscious – to not sleep walk within the circus – and to regain our inner balance when we are challenged by the sweep of raw, unfocused energy.